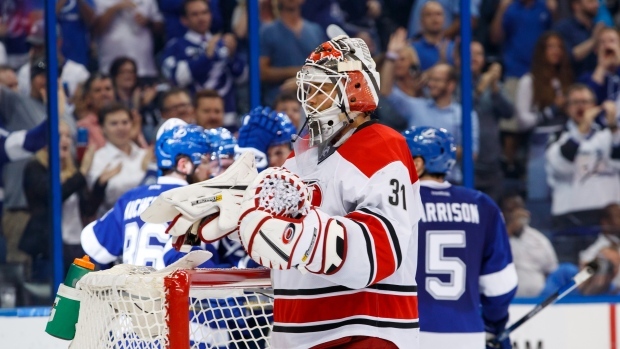 The Calgary Flames have acquired goaltender Eddie Lack, defenceman Ryan Murphy and a seventh-round draft pick in 2019 from the Carolina Hurricanes in exchange for defenceman Keegan Kanzig and a sixth-round pick in 2019. CAR trades Eddie Lack, Ryan Murphy and 7th in 2019 to CGY for Keegan Kanzig and 6th in 2019. CAR retains 50 per cent salary on Lack. The Hurricanes will retain 50 per cent of the salary remaining on the final year of Lack's contract. Prior to the 2016-17 season, Lack signed a two-year, $5.5 million deal. He carries a cap hit of $2.75 million next season. The upshot is CGY gets a back-up goalie in Lack for $1.375M with a year left on his contract. CAR's end of it is financial housecleaning. Last season, Lack played in 20 games. He had a .902 save percentage to go along with a 2.64 goals against average. This isn't the first time Lack has been dealt. He was sent from the Vancouver Canucks to the Hurricanes in 2015 for a pair of draft picks. Meanwhile, Murphy has spent the last five seasons with the Hurricanes, but has bounced between the big club and the AHL's Charlotte Checkers. In 151 career NHL games, he has six goals and 31 assists. Kanzig has yet to appear in the NHL. Last season, he split time between the AHL's Stockton Heat and the ECHL's Adirondack Thunder. In a combined 46 games, he had one goal and six assists.